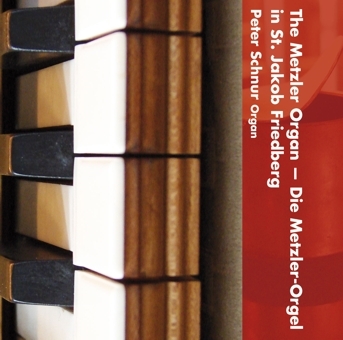 On this CD album, organist Peter Schnur presents for the first time the Metzler organ in St. Jakob in Friedberg/Bavaria in a first-class recording with outstanding interpretations of the presented works. A fine selection of works by German, English, French and Italian composers not only demonstrates Schnur’s artistic skill and sensitivity, but also presents the organ in its full range of tonal colours and performance possibilities as an instrument whose sound is well balanced and lively in every facet. With an assured sense of style, Peter Schnur brings out the vitality and diversity of this organ. In this recording, it is as if the listener were present at a live performance in the church itself, experiencing a feast of outstanding organ music. The accompanying booklet is in four languages and presents further information about the organist, the works and the instrument itself, together with a range of photographs. »The 2001 organ (III/39) in the Bavarian town of Friedberg sees Metzler building a genuinely eclectic instrument with swell box, enclosed chorus reeds and an undulant within an entirely mechanical concept. [...] The church's organist, Peter Schnur, a former student of Daniel Roth, presents a creative programme including a thoroughly 'pedaliter', almost expressionistic arrangement of Bach's manualiter D minor Toccata BWV 913. Further CDs in the series Chromart Classics are coming soon.